6935 Lake Plaza Dr St, Indianapolis, IN 46220 George's Neighborhood Grill offers American cuisine with top menu items that include George's Signature Chicken Velvet Soup, Cobb Salad, and Buffalo Chicken Wrap. Order online with fast delivery to your door! 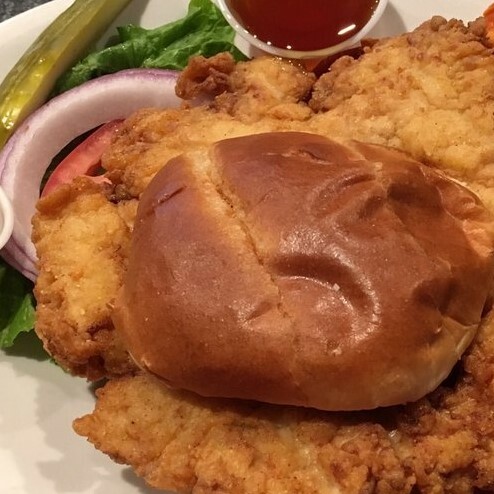 Grilled or hand breaded pork tenderloin. Served mazza-style with Kalamata olives, tomatoes, diced red onion, cucumbers, and warm pita. 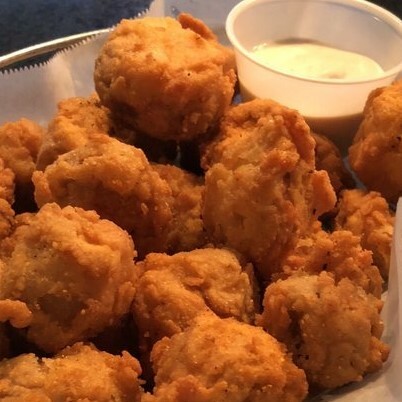 Served with ranch or horsey sauce. 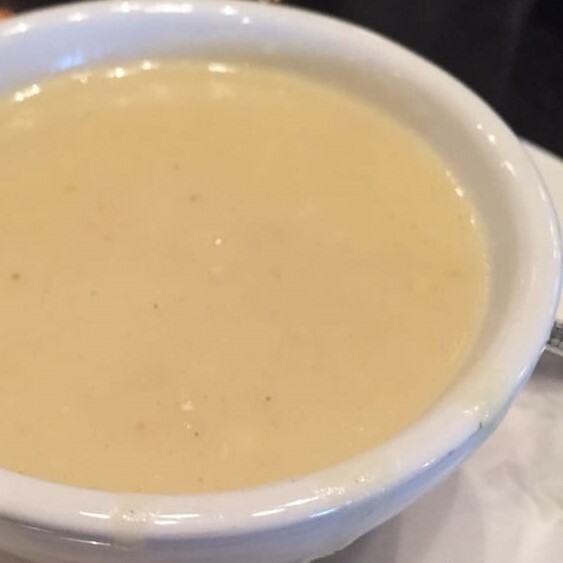 Served hot and delicious with cheese sauce. Additional sauce for extra. Beef chili, fresh tomatoes, jalapenos, green onions, black olives, and a blend of shredded cheese over homemade tortilla chips. Plenty to share. Sub blackened chicken for extra. Three mini Angus Beef sliders with American cheese, grilled onions, and mushrooms. Add French fries for extra. 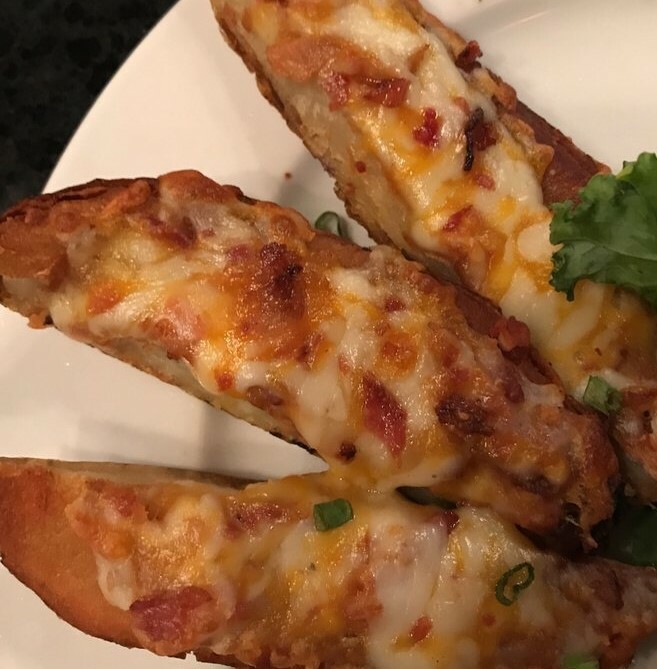 Smothered with cheese, bacon, and scallions. Served with sour cream. Chicken wings with celery sticks and your choice of blue cheese or ranch dressing. Flavors include: Hot, BBQ, Mild, Thai Chilli or Teriyaki 8 wings or 16 wings. 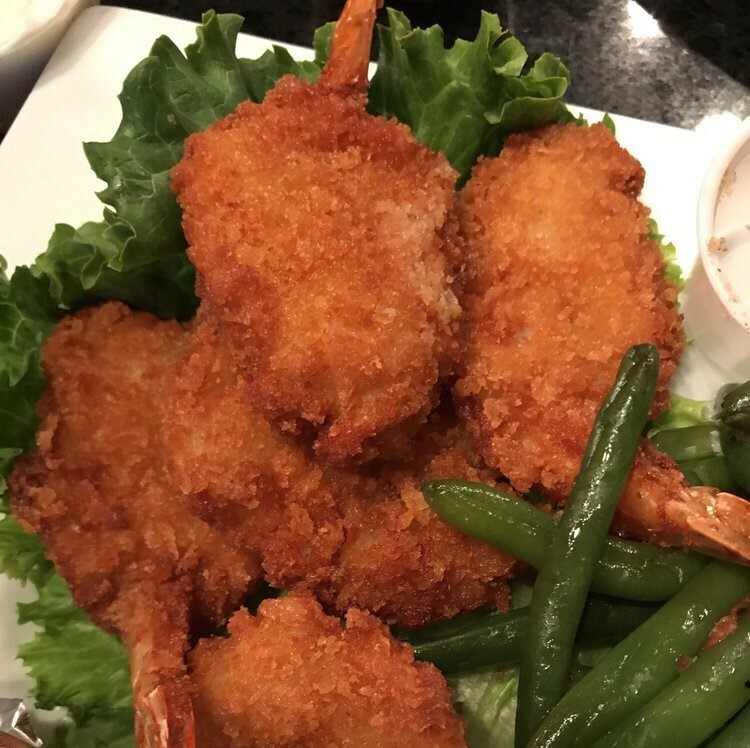 Eight large, succulent shrimp deep-fried golden. 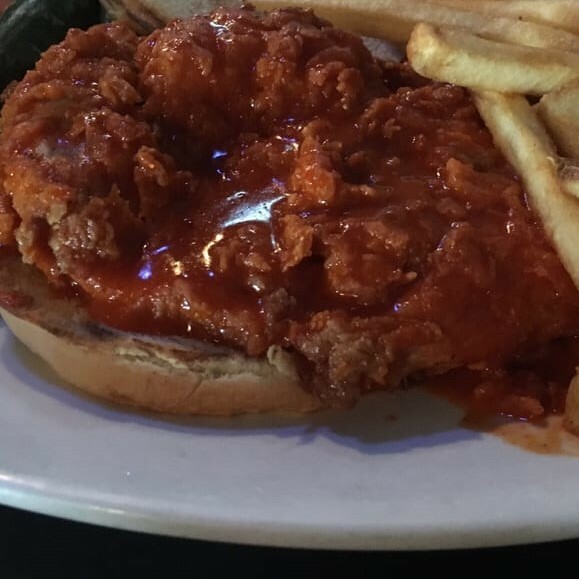 Served with zesty cocktail sauce. 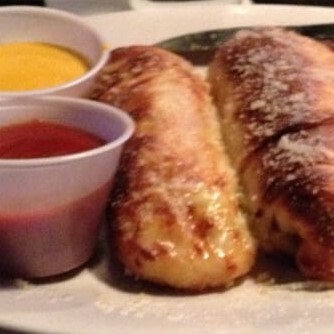 Hand rolled with pepperoni and asiago cheese blend. Served with cheese sauce and marinara. *15+ min baking time. Grilled chicken, crisp greens, beets, sugared pecans, celery, Mandarin oranges, Gorgonzola crumbles, and a sliced apple garnish. Black cherry vinaigrette dressing recommended. 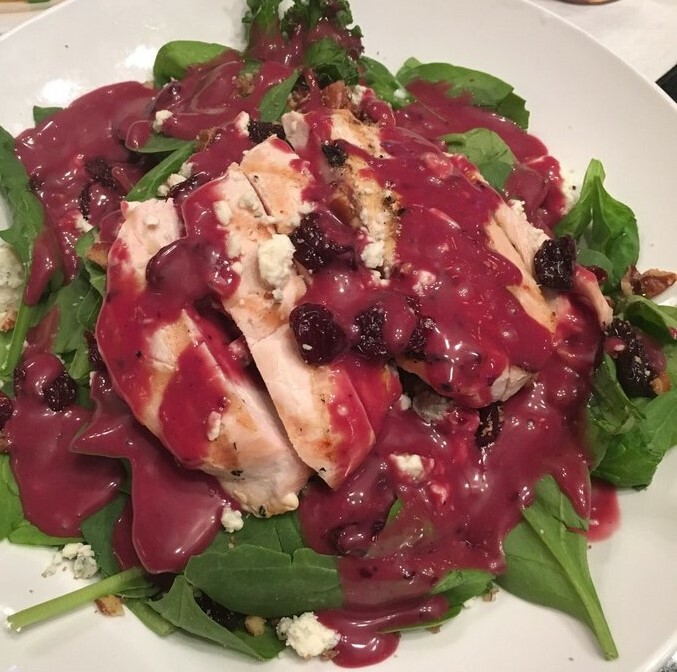 Grilled Chicken Breast with fresh baby spinach, dried cherries, sugared pecans, and Gorgonzola crumbles. Honey mustard dressing recommended. Feta crumbles, diced tomatoes, Kalamata olives, roasted red peppers and mixed greens. 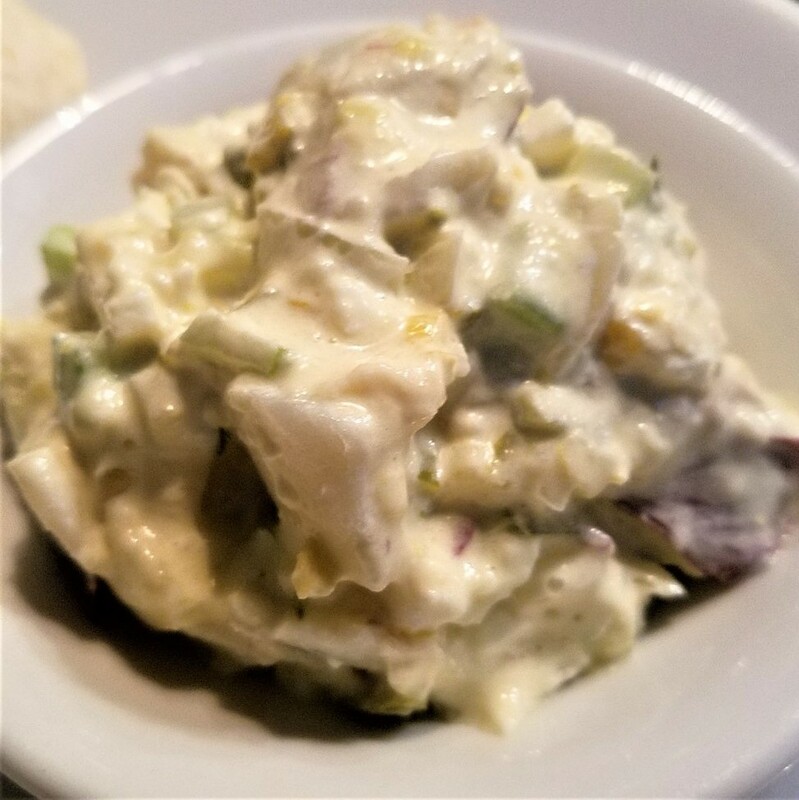 Garlic vinaigrette or Greek Feta dressing recommended. Add chicken, salmon or shrimp for extra. Crisp greens, bacon, turkey, ham, egg, diced tomatoes, and shredded cheese. Charbroiled bistro steak, cooked to order, and served over a crisp salad with diced tomatoes, provolone and Gorgonzola cheeses. Pecan crusted fried tilapia filet on a bed of mixed greens topped with strawberries and gorgonzola cheese. Black cherry dressing recommended. Crisp lettuce wedge, served with Gorgonzola crumbles, diced tomatoes, roasted red peppers and bacon. Bleu Cheese dressing recommended. 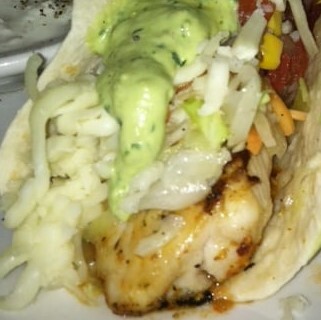 Grilled fresh tilapia dressed with a lime cabbage slaw, Pico, shredded Monterey jack and a light cilantro avocado cream sauce. Juicy turkey burger served with fresh avocado, tomato, lettuce, provolone cheese and a light southwest ranch sauce on a ciabatta roll. 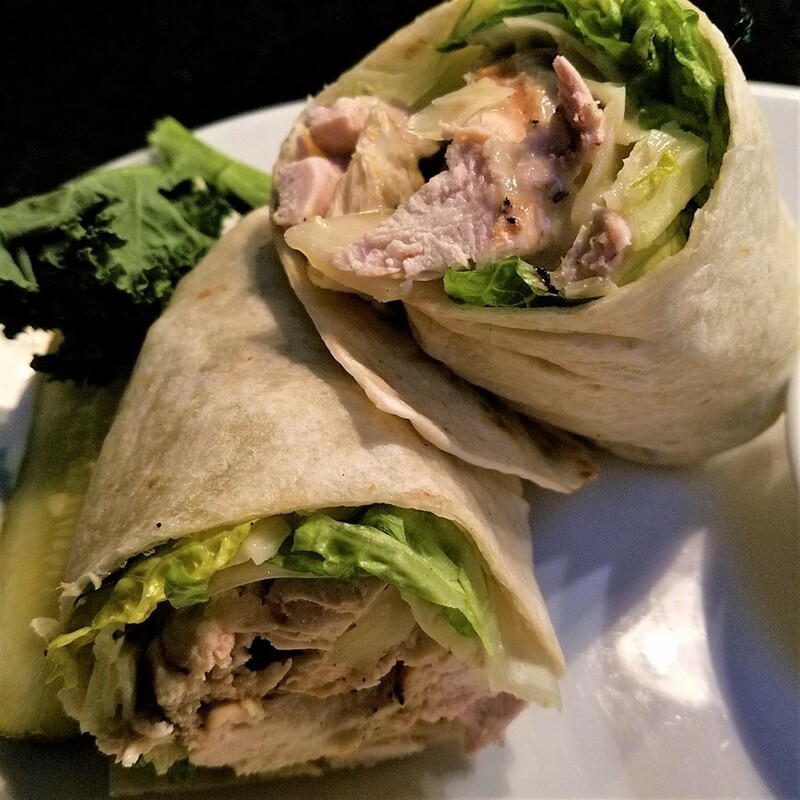 Tender chicken breast marinated in Greek vinaigrette with spinach, tomato, cucumber, feta cheese and tzatziki sauce in a garlic herb tortilla wrap. Grilled salmon topped with a refreshing cucumber sauce served over chilled Israeli couscous tossed with feta cheese, Kalamata olives, and tomatoes. Garnished with a fresh spring mix. 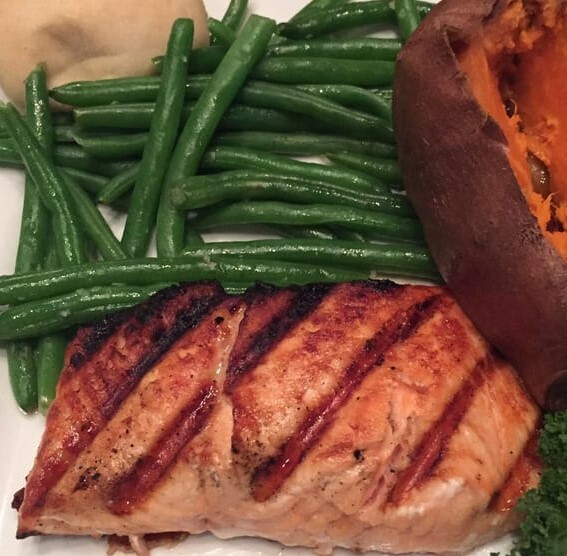 Eight ounce Fresh Atlantic Salmon filet prepared Cajun, lemon pepper, teriyaki style or barbecue. 8 oz. Parmesan crusted chicken breast topped with a light vodka cream sauce, fresh chopped tomatoes, and scallions. 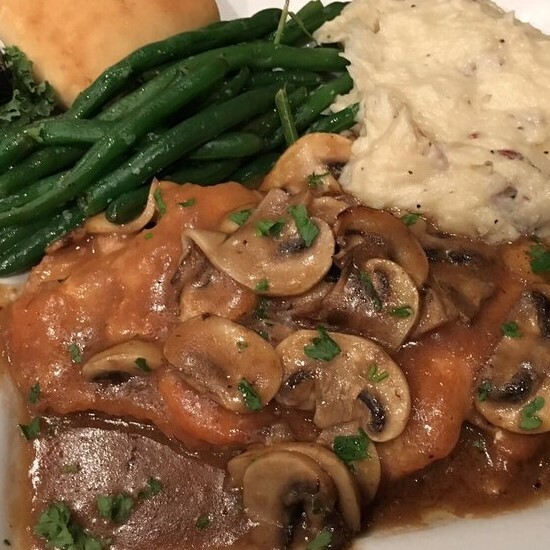 Served after 4:30 p.m. Includes soup or house salad. 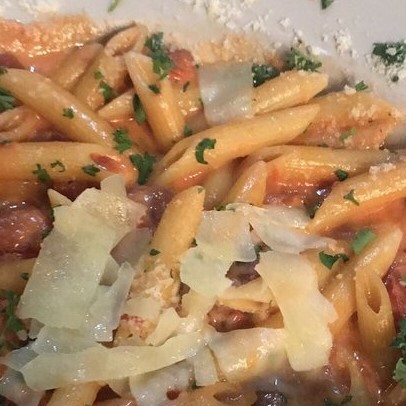 Wheat penne pasta available for any pasta dish. Seasoned chicken sauteed with artichokes and sun dried tomatoes in a garlic wine sauce, tossed with penne pasta. Add shrimp for extra. Penne pasta tossed in a fiery tomato cream sauce. Add Chicken or Shrimp for extra. Angel hair pasta tossed with tomatoes, Kalamata olives, onions, feta cheese, spinach and roasted red peppers in a light cream wine sauce. Add chicken or shrimp for extra. 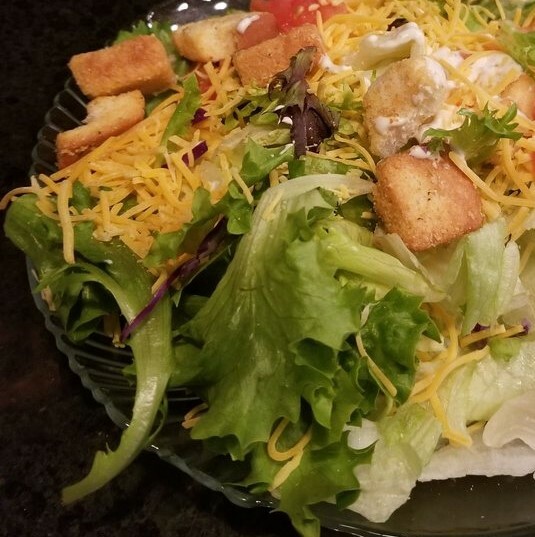 Crisp greens topped with tomatoes, shredded cheese, and baked croutons. Lean corned beef, sauerkraut, and Swiss cheese, served on grilled rye bread. Also available with turkey. 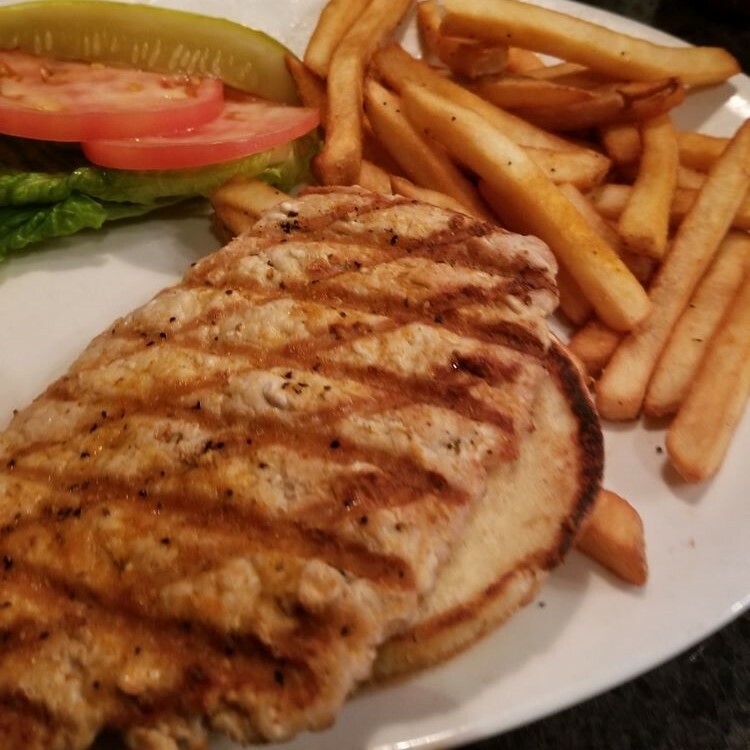 Grilled tuna filet served with lettuce and tartar sauce. Also available: teriyaki, Cajun, barbeque or lemon pepper. 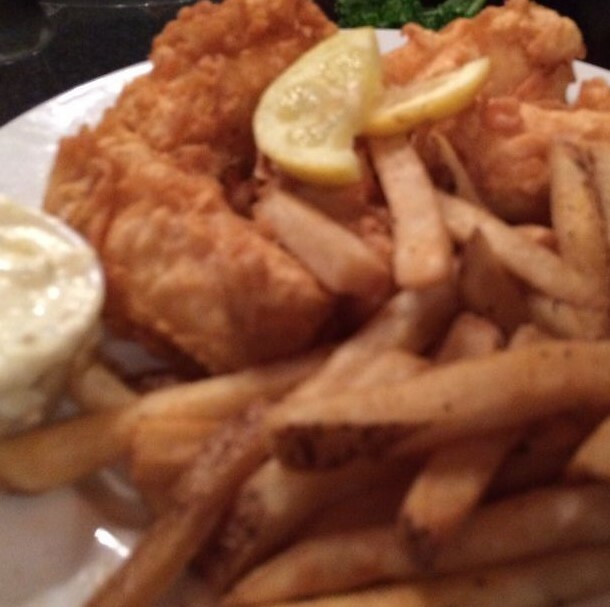 Tender mild white fish prepared grilled or southern fried, plain, cajun or lemon pepper. Served on a toasted hoagie with lettuce, tomato and tarter sauce. 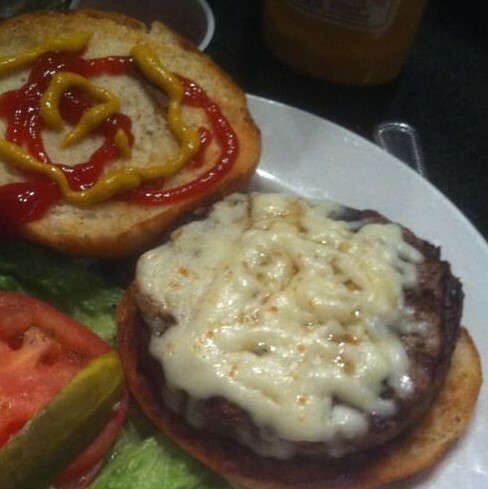 Eight ounces of Angus Beef burger perfectly grilled and topped with grilled onions and Thousand Island dressing. Sandwiched between slices of melted swiss cheese, served on grilled rye bread. 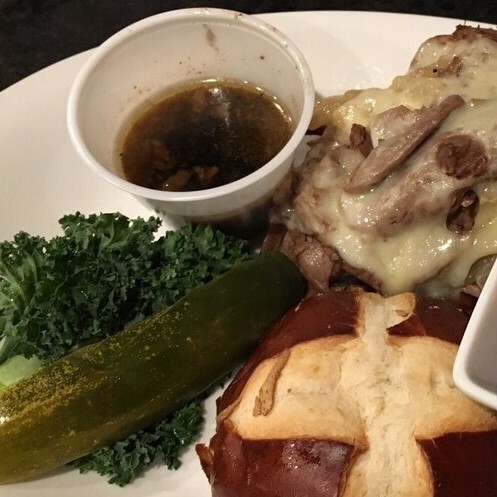 Shaved prime rib with swiss, grilled onions and sauteed mushrooms, served on a pretzel bun with au jus. Smothered with provolone, green peppers, and onions. 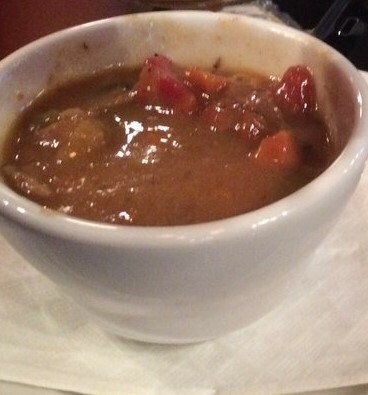 Served with au jus. Ham, turkey, bacon, cheese, lettuce, and tomatoes. Served double decker style, with honey mustard sauce. Grilled or Breaded Style: Cajun, teriyaki, barbeque, buffalo-style, or lemon pepper style. Sliced ham, bacon, and pepperoni smothered with mozzarella in a garlic herb tortilla and served hot with a side of marinara sauce. Traditional fresh and crisp greens with hummus, shredded carrots, cucumbers, lettuce, and tomatoes wrapped in a tomato-basil tortilla. Served with a small side of hummus. Bacon, turkey, ham, lettuce, tomatoes, and honey mustard all wrapped up in a tortilla. Breaded chicken, lettuce, tomatoes, cheddar cheese, and honey mustard wrapped in a flour tortilla. 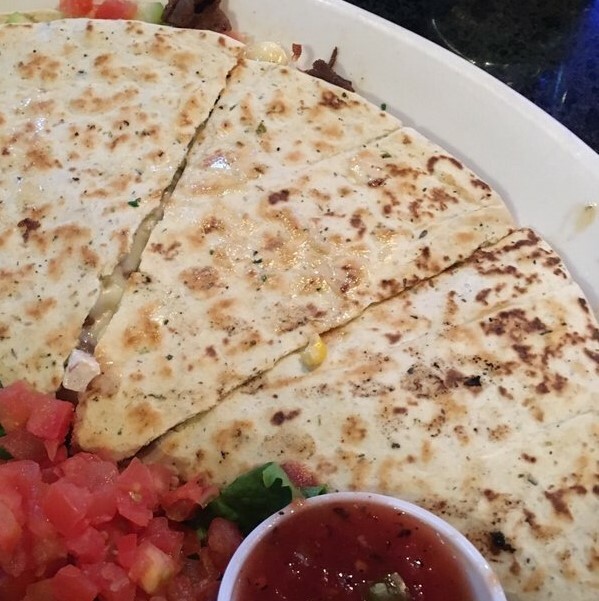 Breaded or grilled buffalo chicken, lettuce, tomatoes and Cheddar cheese wrapped in a flour tortilla. 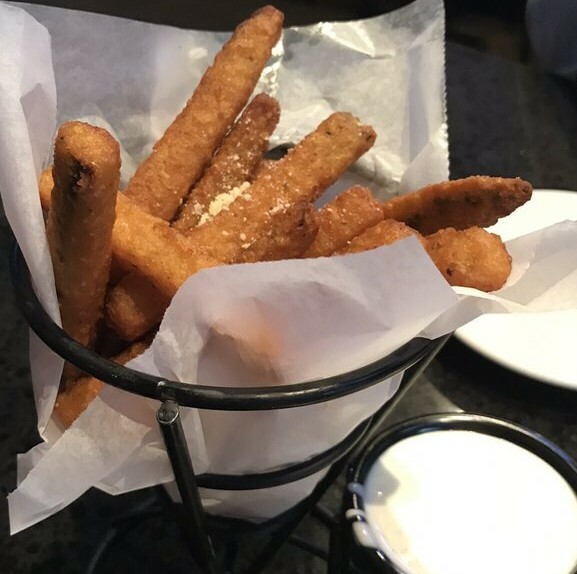 Served with your choice of ranch or blue cheese dressing. Grilled and diced chicken breast, barbeque sauce, and red onions. 12" or 16"
Ham, pineapple, and red onions. 12" or 16"
Fresh Mozzarella, tomato and basil with an Olive Oil base. 12" or 16"
Spinach, black olives, feta cheese, mozzarella, fresh diced tomatoes and pesto sauce. 12" or 16"
Unlimited toppings. 12" or 16"
Ham, pepperoni, and sausage. 12" or 16"
With your choice of butter, cheesy or marinara sauce.